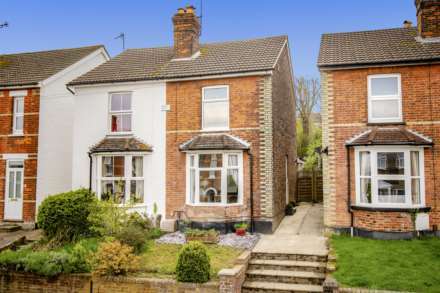 SOLD BY FLYING FISH PROPERTIES Dating back to the 1800s, this delightful period family home sits elevated in the village`s attractive quiet high street. With splendid far reaching westerly views of the High Weald opposite and being a short walk from the popular village primary school, it is perfectly placed. It`s beautiful exterior, a mix of red and blue glazed bricks, hung tiles and double pitched roof gives a nod to its architectural heritage. A block brick off street parking area large enough for 2 cars sits in front of a raised lush green lawn bordered by a rock flower bed overflowing with pretty lavender. The 11th Century church steeple frames the house at the rear, adding another dimension to its impressive positioning. A pathway leads you upwards through either the lattice canopied front door or the wooden gates at both sides. Entering through the rear into the entrance hallway, a utility room is first on your right. It has a sink with under counter plumbing for utility machines and plenty of space for coats and shoes to keep the hallway clutter free. A useful guest cloakroom sits behind. Straight ahead is the living/dining room which delivers fabulous relaxing and entertaining space steeped in history with its exposed ceiling beams. Its windows bring in open countryside views whilst its deep red décor and oak parquet flooring add dramatic glamour to the room. With fireplaces at both ends you can either curl up in front of one in a deep sofa on cold winter nights or dine romantically in front of the other wood burning stove. Conveniently accessed from the dining area is the pretty country kitchen with an abundance of cream wooden cabinetry, wooden worktops and an integrated oven. Its window sits above the deep ceramic butler sink and dapples the terracotta floor tiles with light offering a warm contrast to the neutral cupboards. A pantry and a deep cupboard offering space for a large fridge freezer keeps the kitchen streamlined and spacious. Climbing the stairs to the first floor there are two large double bedrooms at the front with far reaching countryside views from their windows. A bedroom at the rear with a wall of fitted cabinetry and a large family bathroom complete the floor. The paved walled garden at the rear with raised brick enclosed flower beds is a versatile space with a shed and plenty of room for alfresco dining under the church`s chiming steeple clock. A detached brick garden studio with electrics and a telephone point is perfect for a home office but it really could be whatever sanctuary you choose it to be. Well Cottage is a unique home with enormous charm and character that must be seen to be appreciated. Utility room: rear aspect window, stainless steel sink with drainer, counter top with space and plumbing under for appliances, wall shelving and cork tile flooring. There is plenty of room for coats and shoes. Cloakroom: low level WC, wooden effect laminate flooring, wall shelving and radiator. Living/Dining Room: 22`10 x 12` front aspect windows with glazing bars, exposed ceiling beams, oak parquet flooring, front entrance door, recessed opening with beamed surround and side wall shelving and radiators. A wood burning stove with brass frame is sat on a stone hearth at the dining area end with a fireplace with wooden mantle, cast iron surround and fire basket and marble hearth is at the living room end. Kitchen: 9`9 x 8`10` rear aspect window, integrated electric oven with 5 ring gas hob, recessed extractor fan, ceramic butler sink with mixer tap over and tiled flooring. The kitchen has plenty of wooden worktop space and a good selection of eye and base level cream wooden units and open wooden shelf units. There is space for a dishwasher and a storage cupboard is large enough to house a fridge/freezer. A larder provides plenty of storage with inbuilt shelving. The boiler is concealed in a wall cabinet. Bathroom: 8`5 x 8`5` rear aspect opaque window, part tiled walls, panel enclosed bath, pedestal wash basin, low level WC, airing cupboard housing water cylinder with internal shelving for linen, wooden effect laminate flooring and radiator. Bedroom 1: 11`5 x 10`9` front aspect window with glazing bars giving views of the street and countryside beyond, wooden floor, period fireplace, loft access hatch and radiator. Bedroom 2: 11`5 x 10`9` front and side aspect windows with glazing bars, wooden floor and radiator. Bedroom 3: 8`8 x 8`5` rear aspect window with glazing bars overlooking the rear garden, a wall of fitted wardrobes part mirrored with hanging rails and shelving and radiator. Outside: to the front is an off-street block brick parking space for 2 cars with block brick pathways leading upwards at both sides to the rear and the front entrance lattice canopied porch. A rock enclosed flower bed sits in front of the raised lawn area with a brick enclosed well placed to the side with a feature cast iron cover. Rear access can be gained either side through wooden gates with bin storage space to the right and a wooden shed. To the rear the garden is a block brick space with raised brick flower beds and a natural rock walled perimeter with the village church sitting high above is at the back. A detached brick garden studio with a part glazed stable door, a front aspect window, electricity, lighting and a telephone point completes the garden. 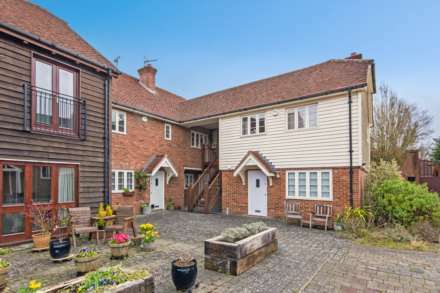 It has an active community with an historic 10th Century church, a local primary school which is ranked by Ofsted as good, a petrol station, a local convenience store and a popular recently and extensively refurbished village pub, the `Kentish Hare`. The Kentish Hare has 2 AA rosettes and is listed in the Michelin Good Pub Guide - it is owned by celebrity chefs, the Tanner brothers.